Escargot. A name for slimy little things thought to be elite delicacies since ancient times. I am not necessarily a judge of elite delicacies, but I do know about what I consider nostalgic foods that may also be considered elite and delicate. The first time I learned of the existence of escargot was an anniversary dinner held by my parents when I was a kid. What I remember from back them was pretty little sea shells bubbling with butter. I soon found out there were also snails, garlic and salt in the shells. Using some funky tongs and little forks, the snails slid out, then mom and dad dropped them in their mouths and they smiled. 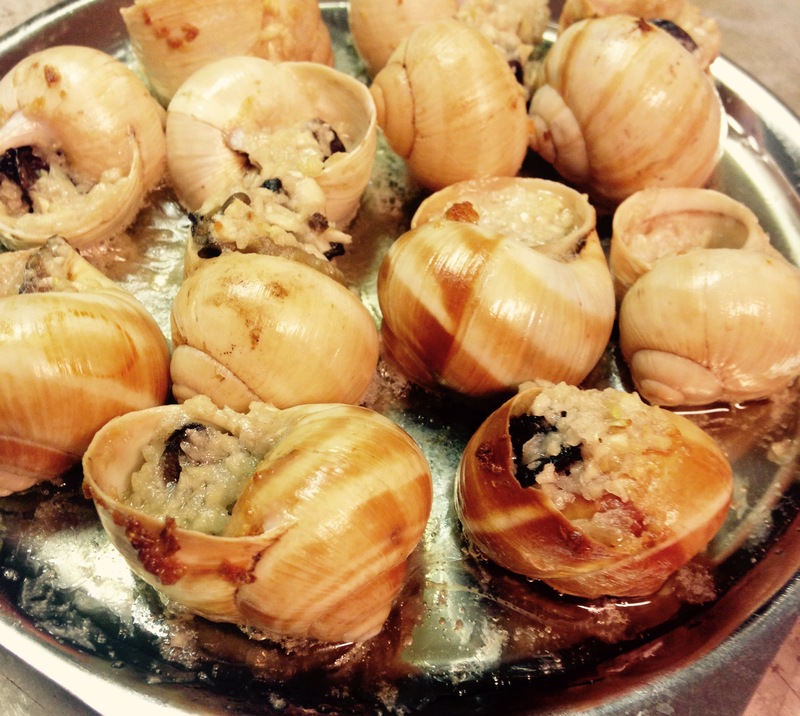 I know that part of that smile was remembering doing the same thing in France many years prior, but they were also enjoying the here and now–the simple flavors of butter and garlic covering a common gastropoda. It is almost hard for me to call this a recipe, but one thing I like to do on this blog is to include some basic recipes that help appreciate the common and slightly less common. Along with the plethora of quick and easy chicken and pork chop recipes I like sharing other more delicate items, like lobster, scallops and fondue. Escargot is fun and delicious. My family downed six dozen snails over the holidays while we laughed, cried and told stories. They brought back memories because they were shared before. Little B tried one, but honestly could not down it. I think it was because it was too similar to a mushroom, which is currently a hated element. Maybe it was too garlicy or salty. Maybe we were too excited about her trying it. I don’t know and probably never will. It does not matter. What matters is that next time she is presented with escargot I hope that she smiles, remembering the first time she tried it, regardless of whether or not she sticks another snail in her mouth. Memories count. A lot. This is the fourth anniversary of this blog. There have been an amazing number of things that have happened, both personally and professionally during the past four years. What I can say, at this point in time, is that I am excited and emboldened by where I am in my life right now. It is scary to start a business, especially for me. As a lifelong introvert it is impossible for me to explain to you what I feel when stepping forward with my love and passion to total strangers and the general public. It is a strange and wonderful experience as time passes and the reactions of other people are experienced and evolve. It all started with this blog in a small Texas town and is now a business with a passionate family behind it. Thank you to family and friends who have been there the whole time, and to the new friends who are becoming a lovely reality in the now. Life could not be better. Combine butter, garlic, shallots, brandy and some salt. Stir until well combined. Let rest at least one hour before cooking snails, leaving it at room temperature. For each shell drop approximately one teaspoon of butter mixture into a shell, press the snail in, small side down, until resistance is felt. Add more butter on top. Place filled shell on baking dish so large opening is facing up. If an escargot plate is not used, then rely on a medium iron skillet, making sure shells sit in skillet snugly so they cannot roll over during baking process. Repeat until all shells are filled. Place dish in oven for 10–15 minutes, until butter is bubbly while garlic and shallot bits begin to brown. Remove dish from oven and serve immediately. Fully utilize butter sauce by dipping with power bread, foccacia or other absorbent, wonderfully consumable element.